Any Boston University student can step outside their dorm, and it’s likely that they’ll find at least one option for pizza, burgers, burritos and sushi within walking distance. But there’s only so many times a semester students can frequent their favorite takeout joints before their taste buds will start crying out for help. The best cure for that may be an uncommon restaurant with Amsterdam vibes and food that’s all about Middle Eastern flavor. Matt D’Alessio, owner of Davis Square’s Amsterdam Falafelshop, wanted to expose BU students to just that when he decided to set up the franchise’s second Boston location in Kenmore Square. The restaurant officially opened its doors on Friday afternoon. The opening in Kenmore is a piece of D’Alessio and business partner Laurence Wintersteen’s larger plan to popularize falafel and the Amsterdam Falafelshop brand, which is based out of Washington, D.C., among the large student population within Boston. “From day one when we latched onto this brand, we knew that we would do well serving a younger demographic, and so with so many college students in the area, we followed the trade areas that had a large concentration of students. Davis Square, Kenmore Square and Central Square, being in the middle of MIT and Harvard, were our top three choices,” D’Alessio said. After a two-year competitive bidding and vetting process, the shop was approved by Boston University, which owns the Kenmore Square space, next to Bruegger’s Bagels and near UBurger. Amsterdam Falafelshop offers sandwiches on white or wheat pita, as well as salad bowls containing the chickpea fritters that give the restaurant its name. 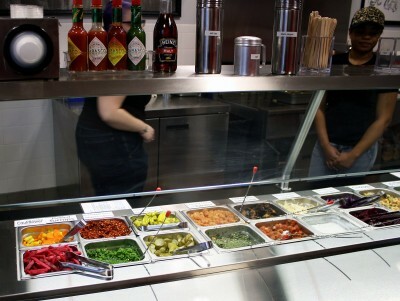 Customers can also top off their falafel with their choice of 21 different sauces and toppings offered on a buffet-style bar — D’Alessio calls this method “top-it-yourself falafel” — and try out their Dutch-style French fries, called fritten. “They [the falafels] are fried twice, which makes them extra crispy on the outside but nice and fluffy on the inside,” D’Alessio said. For those looking to follow up their falafel with something sweet, Amsterdam Falafelshop also offers brownies, made in house, and stroopwafles, thin waffles with sugary caramel syrup in the center, which are imported straight from Amsterdam. All of Amsterdam Falafelshop’s offerings are vegetarian and can be made vegan by avoiding the four non-vegan toppings offered or gluten-free by skipping the pita and opting for a salad bowl. The restaurant, he said, will have a student-friendly atmosphere, with 45 seats at tables, as well as two window-seating areas with stools. While free Wi-Fi will not be offered early on, D’Alessio said adding Wi-Fi and making it a space where students can come to get work done will likely happen after its first year. Amsterdam Falafelshop in Kenmore Square is the franchise’s seventh location and the second within the Boston area. D’Alessio, a Somerville resident, frequented Amsterdam Falafelshop’s original store, which opened in 2004, as a college student in Washington, D.C. He opened Amsterdam Falafelshop’s first franchised location in Davis Square in July 2012. D’Alessio and Wintersteen hope to continue to expand the brand throughout Boston and are actively scouting out their next location. D’Alessio said he hopes to see Amsterdam Falafelshop in other areas with heavy student populations in the future, such as Central Square, Kendall Square and Allston or Brighton.